Christian greetings in the precious Name of our Lord Jesus Christ; we always appreciate your company in fellowship around God's unchanging Word. Jesus prophesied "false anointed ministers, and false prophets would arise and show great signs and wonders; insomuch that, if it were possible, they shall deceive the very elect" (Matthew 24:24). Paul foretold Satan's (Gk.) 'parousia' coming veiled behind "that man of sin, the son of perdition after the working of Satan, with all power and signs and lying wonders" (II Thessalonians 2:3, 9). Our subject today is "Anointed Ones at the End Time," who by their propaganda, political power and deadly coercion have nations at their feet. Take for instance Judaism or Pharisaism which is not at all the faith of Moses and the prophets, and 'Jews' are generally neither Israelites nor are they are they even Semitic, yet the united States and other countries grant Israel billions of dollars each year on the strength of this imposture. Another example is the Judaeo-Roman Universal church which was never a Christian institution but so-called Christian nations dare not expose her imposture. Please visit the links in our main article, and follow the links and the Full story behind our news items. September 18, 2018 — Israel was caught . . . kidnapping children who were then murdered to film a fake gas attack to give Trump a rationale to start a war to save himself from Manfort's testimony . . . Vanessa Beeley had just interviewed parents of one of the kids we now know the Israeli's kidnapped. Israeli planes hid themselves behind a Russian IL20 coming in for a landing in order to make a retaliatory strike on Syria . . . in response to the Russia/Turkey/Syria agreement on Idlib which surgically removed the US from any role in the planned upcoming mass attack on Syria. Israel . . . joins the US and Britain in the recent gas attacks in Idlib that killed dozens . . . Trump and Netanyahu's temper tantrum . . . releasing their video, kidnapping and murdering children is a waste. September 19, 2018 — Who were Anselmo and Abraham Ha Levi Kahana de Palenzuela? When did they rename their family as "Warburg?" Did they literally hire Adolf Hitler and build Auschwitz? Chased from Spain in 1492, they returned with a vengeance under the leadership of Ignatius Loyola. From that point, the Jesuits and their allies among the "del Banco" families of Genoa and Venice [oligarchies of the Black Nobility] controlled the papacy. Ancient Sephardic (Canaanite/Phoenician) Jewish families . . . have run world affairs through control of currency and central banks across Europe and, eventually, into America, since the 16th Century. In the process, they created colonialism . . . enslaved the Africans and shipped them around the world, ran opium into China, built America's railroads and ethnically cleansed the New World . . . founded communism . . . put Lenin in Russia in 1917 . . . built Nazi Germany and put Hitler in power . . . financing Napoleon and those who fought against him, founded the Bolshevik/Zionist Soviet Union . . . No Jews left Judea and Sumaria circa 100CE . . . nobody went to settle in a non-existent Germany or Poland . . .
September 17, 2018 — There are two serial numbers found on fragments of the missile, which shot down the passenger airliner in June 2014 according to an international team of investigators led by the Netherlands. The numbers were marked on the engine and the nozzle of the missile. The Russian military on Monday said they had traced them to a missile which had the producer's serial number 8868720. Speaking to journalists, Gen. Nikolay Parshin showed a document trail of the Buk missile. According to the documents, some of which have been declassified for the presentation, it was produced at a military plant in Dolgoprudny in the Moscow region in 1986. The missile was shipped from the plant on December 29, 1986 and delivered to military unit 20152 located in what is now Ukraine. It is now called 223rd anti-aircraft defense regiment of the Ukrainian armed forces, the report said. The unit took part in Kiev's crackdown on rebels in eastern Ukraine in June 2014, the general said. Are we on the verge of another great financial crisis, a devastating recession and a horrific implosion of the global debt bubble? . . . I have been relentlessly warning my readers about the inevitable consequences of our very foolish actions, but now the mainstream media is beginning to sound just like The Economic Collapse Blog. The coming crisis is so close now that a lot of them are starting to see it, and of course economic disaster is already a reality for much of the rest of the planet . . . The following are 8 examples of mainstream media sources warning us of imminent economic disaster . . .
#1 Forbes: "Disaster is inevitable when America's Stock Market Bubble Bursts . . ."
September 6, 2018 — The origins of the "genocide" charge embedded in these comments can be traced (inevitably) to a coterie of Jewish academics and intellectuals including, most prominently, Latrobe University historian Tony Barta and Sydney University genocide studies professor and "anti-racism" crusader Colin Tatz. In collaboration with Winton Higgins, Anna Haebich, and A. Dirk Moses, these Jewish intellectual activists have succeeded in ensuring that "genocide is now in the vocabulary of Australian politics . . . [like three holocausts of six million so-called Jews in the 20th century—many more in the Talmud—three World Wars, 9/11, etc." Full story: Part One. Comment: When the Soviet Union collapsed and socialism gave way to neoliberal privatizations the moral fury of the leftwing movement had to go somewhere, and it found its home in Identity Politics in which the white heterosexual male takes the place of the capitalist, and his victim groups—blacks, women, homosexuals, illegal immigrants—take the place of the working class (paulcraigroberts.org). And the 1% take home the bacon. The original Australian inhabitants . . . were hunted down and virtually wiped out by the invading newcomers who came overland and down from India and crossed the land bridge from Indonesia to Australia. The tip of Cape York was one of the major landings used by the Indian invaders, who arrived either in canoes or on rafts. Archaeologists in 1973 decided to look for campsites and other evidence on the Cape, finding fire places and middens. Although unreliable, carbon dating of shells and other organic matter was used. To the horror of the investigating academics, the best they could come up with was sometime between 600 and 1,100 years of occupation by the Aborigines . . . it does beg the question; What about the claim Aborigines have lived in Australia for 40,000+ years? Aboriginal land claims, native title and land rights are based on what would appear to be a false anthropological premise and are totally fraudulent according to astounding new Australian archaeological discoveries and recent linguistic studies. South Africa Launches racial economic terrorism on White farmers. South African bank wants farmers to repay debt for property even if it's expropriated by government. Genesis 3:15 explains the mindset of non-Semitic, anti-Semitic self-styled Jews in contrast with the descendants of Jacob in exile after 2,500 years "for fear of the Jews" pending the soon-coming utter defeat of the modern state of faux Israel and the mass exodus of the impostors to their homeland, Khazaria, and the return of Jacob's children for their redemption. September 7, 2018 — In the highly controversial area of human intelligence, the 'Greater Male Variability Hypothesis' (GMVH) asserts that there are more idiots and more geniuses among men than among women. Darwin's research on evolution in the nineteenth century found that, although there are many exceptions for specific traits and species, there is generally more variability in males than in females of the same species throughout the animal kingdom. Comment: A further example of "the squeeze" and thought control. The obvious answer is the responsibility of motherhood. Men and women are not equal and each has a God-ordained role. SECRET Grand Canyon Gold Mine! The past 2,500 years have been the times of the Gentiles wherein God had instructed Moses, Isaiah, Jeremiah, Ezekiel, Daniel, Hosea and Zechariah to prophecy how He would chastise Israel for worshiping the Babylonian Trinity of gods. True to His Word, Israel has been sifted and oppressed by the super powers of Babylon, Medo-Persia, Greece and Rome since Nebuchadnezzar's invasion of Jerusalem in 606BC and is under the foot of the Roman church empire to the present day. Consequently, Western history of the past 2,000 years has recorded the conflict between apostate Hebrews and self-styled Jews on the one hand and the apostate self-styled Universal 'church' of Rome on the other. But of course the history taught in our educational institutions is slanted by Rockefeller's Jewish interests as they have the "franchise" over education to manipulate the young to conform to a predetermined mindset suited to world government purposes. One must read beyond this propaganda and study original source material just as you must prove everything I say with your own Bible, sometimes studying a word in the original tongue. I would like you to understand and be able to prove from your own Bible, from history and from Brother Branham's Message how Christ and His angels, us Christians, have fought the Dragon and his angels for 2,000 years. The Dragon is Satan who used the four Gentile empires to chastise natural Israel, and in AD325 transformed Rome into a church empire to fight Spiritual Israel, Christ's true Church. Satan's a great impersonator; so are his angels. As we're fighting a spiritual war we should know who the enemy is. He began by impersonating Israel, sowing discord through denominational differences between Sadducees, Pharisees, etc., and deceiving men like Judas Maccabaeus, who, a hundred years before Jesus, tried to do God a service without it being His will when he intermarried Judea with Edom, who are primarily Serpent's seed. The Jewish Encyclopaedia says "Edom is modern Jewry." Indeed anyone who rightly divides God's Word to make their calling and election sure will know from Jewry's most eminent scholars how over 95% of "Jews" have NO Semitic descent and NO claim to the Covenants of Promise. They are impostors of Cain's lineage and the enemy of Israel. Those familiar with William Branham's Message and born of the Holy Spirit will know this is his Bible-based teaching found in all Jewish Encyclopaedias and recorded by Jewish historians. Satan's angels are therefore the apostate and self-styled Jews who ever withstood the Israel of God, and the false Universal Church of Rome. Both are warring for supremacy over the Synagogue of Satan and Babylon. Jesus said they would be "so close they would deceive the very elect IF it were possible." That means these demons are in the circle of this Message. Talk about impersonators. "So close"! The break-up of the Roman Empire brought about a change in Jewish economic activity from local trades to national and international enterprise. This was facilitated by the widespread network of Jews in both Islamic and Christian lands, Jewish group solidarity with their common tongue, and a uniform system of commercial law based on the Talmud. The trend was encouraged by an increasing exclusion of Jews from land-owning, especially in northern Europe. Economic pursuits were severely restricted. The rabbis preferred them to live in special quarters or ghettos, they wore distinguishing clothing as Moses instructed (Deuteronomy 22:12), yellow badges replacing the fringe. As property of the king, they fell under threat of confiscation of property and expulsion, as kingdom by kingdom, the Europeans were exhausted by their evils. Note that most of these "Jews" were non-Semitic Canaanites or Edomites, not Hebrews or Israelites by blood, nor "Abraham's children" by works. One by one, the rulers of Western Europe expelled them from their realms: England in 1290, France in 1394, Spain in 1492, Portugal in 1492 and many German cities. Thus, after 1497, there were no professing Jews left in all of the lands bordering the Atlantic including England (except an underground of forced converts). These 'Jews' returned on the coat tails of the Protestant Reformation of the Roman Catholic system of worship, backing Protestantism as a vehicle to attack and weaken Roman power. But they also sought to undermine the faith. Jewish authorities are well aware of the two phases of Luther's ministry. In the first, he was filled with sympathy for their long unbelief which he laid on the unsympathetic attitude of the Roman Catholic church and wrote "Jesus Christ was Born A Jew." But of course he was not, He was a citizen of another country, and had He been born a Jew He would have been disqualified as the KINSMAN Redeemer for Adam's fallen race. Their treachery against Luther and his study of the Talmud became the dividing line. After Luther became conversant with the Talmud and the ritual cursings of Judaism, he declared that a person who condones such blasphemies partakes of them. His second phase was one of warning against the self-styled Jews as destroyers of Christianity and of Christians. Self-styled Jews were influential in Henry VIII's establishment of the Church of England and the seizure of Roman church property. (Christianity was established in England some three hundred years before the Roman Catholic church existed). In the long war between Rome and the self-styled Jew, Protestantism has been their effective front. In Ireland, hostilities between Catholic and Protestant are in truth a battle between Rome and the self-styled Jew with the Irish mere pawns in the game. This was evident in World War II when the Irish assisted Nazi Germany against the Jews of the City of London who run the Empire. Looking at the friction between Jewish-controlled quasi-Protestant Britain with her Royal Family of self-styled Jews, and her European Union partners of the old Roman Empire. Can Britain remain in the EU and submit to German hegemony? Remember, it was German emperors who ruled the Holy Roman Empire. 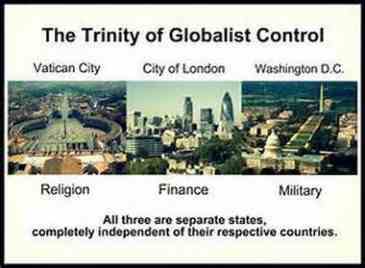 I expect the City of London will seek to maintain their world dominance through control of America and the Commonwealth, dividing, conquering and manipulating to its strategic advantage as she has ever since the 'Jews' conquered and took control in 1688. (Readers of this letter should know that 'The Spider's Web: The City of London, is Britain's Second Empire,' a sovereign nation state, independent of England just as Vatican City State and Washington DC are sovereign nations independent of Italy and the States of America). The City of London is the chief rival to Roman power. Rome will rule unto the consummation and Political Zionists will be forced into an agreement in order to preserve the value of their holdings and commercial existence once the world money system collapses (Daniel 9:27; Revelation 17:12-18). In world politics today we see the Anglo-American bloc, a Jewish front, the European bloc, the Judaeo-Roman church, the Moslem world and Judaeo-Communism. Did I miss someone? What about the late Herbert W. Armstrong would-be-if-he-could-be Elijah. He wrote, "The United States and Great Britain in Prophecy" a book I do not recommend. It would be interesting to know who is behind his World Wide Church of God which claims the United States and Britain are the descendants of the Tribes of Ephraim and Manasseh and successors to the so-called lost ten Tribes of Israel. This is the Jewish hoax of British Israel theology. It is fascinating how this well-connected worldly figure with such prolific publishing interests never mentioned the secret arms of the City of London such as the Royal Institute for International Affairs and Council on Foreign Relations, Rothschild interests, etc., I imagine he was an asset and his religion a tool of the City, as Mormonism is a Zionist/Masonic front. Going back into history, John Dee, the Jewish Astrologer Royal to Elizabeth I, who is said to be responsible for the development of England's navy, foresaw the establishment of an empire built upon maritime power. He invented the British Israel cult which has its roots in the Jewish Cabbala. Menasseh Ben Israel, the Amsterdam Rabbi in Cromwell's conspiracy to bring England under the power of Jewish bankers, later introduced the concept that the British are "the Lost Ten Tribes," which would make 'Jews' their relatives and deserving re-admittance to England. Having been expelled in 1290, they were readmitted under duress in 1657 ("Life of Menasseh Ben Israel" by Cecil Roth, Jewish Publication Society of America, 1945; "The Inner Government of England", Vol. 1, p. 275). Armstrong fostered this cult which gains ignorant support for the activities of the City, their successes in turn "vindicate" their false prophecies. "Christian Identity" groups justify the same delusion, unaware they are condoning and promoting the conspiracy of their avowed enemy. The prophet of Malachi 4:5-6 and Revelation 10:7, William Branham, said, "There is nothing to British Israel Doctrine" (The Signs of His Coming; Seven Seals, 543:4). 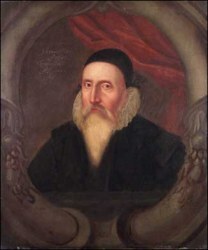 Nevertheless, the work of John Dee hides a truth as Britain's Empire and Colonies are all Jewish Colonies of the Empire of the City of London and remain so to this day. Look at Canada, Australia, New Zealand and the US. That old communist devil, President Woodrow Wilson, who sold-out his country said, ". . . there is a power somewhere so organized, so subtle, so watchful, so complete, so pervasive, that they had better not speak above their breath when they speak in condemnation of it" (Woodrow Wilson, The New Freedom, p.13-14). These non-Semitic anti-Semitic Jews have such a hold on the law you'd better be careful what you say about them in Canada or Australia. Paul stated he was not a Jew adding, "Israelites of the flesh are not necessarily Israelites of the Spirit" (Romans 9:6; Philippians 3:4-6). Statistics published by Encyclopaedias Judaica and Britannica declare something like 95% of "Jews" are non-Semitic and unrelated to Judah or the other eleven Tribes according to the flesh. Did you know that the word 'Jew' was unknown in any language prior to 1775? When the Rheims Bible was printed in English in 1582 the word 'Jew' did not appear. Nor was it in the King James Version published in 1611. And it did not appear until the revised eighteenth century editions. The original word means "Judean"—someone from the country of Judea, and had nothing to do with race or religion. But during the eighteenth century a well-organized, well-financed international pressure group created the "secondary meaning" for this word Jew which has confused the world today. (Benjamin H. Freedman, Facts are Facts; William Branham, Church Ages, p. 120). But this comes much closer to home. Many who call upon the lovely Name of our Lord Jesus are certainly not Christians. Mostly because they have never been born-again. Even in Message circles, few show evidence of new birth (John 16:13). Others are deliberately anti-Christ. Some are plainly Judas'. Revelation 2:9, "I know the blasphemy of them which say they are Jews, and are not, but are the synagogue of Satan". Brother Branham asked, "Now why do we have a people mixed in the framework of the church and calling themselves Jews? The reason is this: Since they were liars they could make any claim they wished [John 8:44; Revelation 2:9; 3:9]. They could say what they wanted as though it were a fact and then stick to it. And in this case they could be lying with a very powerful thought in mind. Was it not so that the early church was almost if not entirely composed of Jews, making them the original members of His body? The twelve apostles were Jews, [Galileans and] Israelites, and the later apostles were either Jews or proselytes. Thus for men to swear they were Jews would give them a pre-eminence and a claim to originality. Tell a lie. Stick to it. Never mind fact or history. Just say it and keep saying it to the people, and soon the people will receive it. Now did you catch something there? Isn't that the same spirit right in the church today? . . ."
[Brother Branham goes on to speak about the Roman Catholic false church]. But isn't that same spirit mixed in the framework of the Church today? Man who walked with the Prophet establishing world-wide reputations upon their original association with the Message. Man of renown, who sell-out the foolish virgin who follow them to a bunch of self-styled Jews. Brother Branham went on, "Consider the thought of blasphemy. These of Satan's synagogue were not blaspheming God in this instance (though that goes without saying) but they were blaspheming the true Church. Certainly. As Cain persecuted and killed Abel because he (Cain) was of that wicked one . . . The group that inched its way ever so slowly into the church by its DEEDS (Nicolaitanism) no longer fears exposure but is openly organized in a group of its own assembling and is coming against the true church in undisguised hostility" (William Branham, Seven Church Ages, 120:1-121:2). This is happening in the Message TODAY! Unregenerate Rabbis who say they are "Jews" when they are NOT, are invited to speak before believers (NOT followers) of Brother Branham's Message who think they are Israelites and Hebrews in the Orthodox faith when they are in fact non-Semitic self-styled Jews, at best Japhetic but more likely Hittite or Canaanite Serpent's seed. They might be cultured, but these men are not Christians and follow the pantheistic Talmud, a book of absolute filth that curses your Jesus and allots "get out of hell cards" to those who cheat and kill Christians. Check-out what these carnal men believe http://www.templemountfaithful.org/ and http://www.lttn.org. LTTN stands for "Light to the Nations" (now on-line gambling). This was the website of Rabbi Chaim Richman who with Rabbi Gershon Salomon spoke to many Message churches in Canada and the united States. This is his article claiming "One of the most important foundations of Jewish faith is the belief that G-d gave Moses an oral explanation of the Torah along with the written text." The Oral Torah (so-called) is the Babylonian Talmud of which Jesus said, "You make the Commandment of God of none effect by your tradition . . . In vain do they worship Me, teaching for doctrines the commandments of men" (Matthew 15:6-9). Can Light come from Talmudic darkness, from the unregenerate descendants of the Twelve Tribes who failed to fulfil and lost for all time that sacred charge, or can a 'Jew,' even a genuine Hebrew following Yaheh Torah deliver Spiritual Light to the Gentiles when God's Bible says "G-d has blinded them until the last Gentile is born-again" (Romans 11:25). We have THUS SAITH THE LORD Jewry is thoroughly blinded to the things of God and in darkness until almost seven years after Los Angeles sinks beneath the sea. What is the motive and objective of putting rabbis in the pulpit? Is it power? Read what these men have written. They are pagans!!! It is gross carnality. The Roman Catholic church has greater Light. You wouldn't allow the Pope into your pulpit, what business have these infidels with the Word of God? Who cares about their Temple myths? Jesus Christ replaced it 2,000 years ago (John 2:19-22)! YOU are the temple of the God of Abraham, Isaac and Israel (I Corinthians 6:19). Brother Branham called this "blasphemy against the Church"! What business has an unredeemed Jew behind God's pulpit? The Bible and the Prophet forbad it! It is presumption. Congregations who welcome, listen and applaud what these men say have never been born-again. No saint of God would tolerate a 'Jew' or any other unregenerate person in the pulpit. Brother Branham said unless he's met the Pillar of Fire, or been born-again, NO MAN has a right to strand behind that sacred desk! Anyone with an ounce of Christ would have spoken to their pastor. If he didn't repent, they'd never darken his sinful door again. Where is the Holy Spirit that such blasphemy is permitted? I'll tell you where He is not. He is NOT in that assembly. Not in the pastor, not in the deacons, not in the song leader or anyone who would tolerate such an affront to God. They're all DEAD, not discerning the Body of the Lord which is His Church (I Corinthians 11:29-30). Brother Branham said, "If a person can't receive a revelation of the true Oneness of the Godhead, scriptural water baptism and the Serpent's seed, just WALK AWAY FROM THEM. You know the election is off!" Not only are the Rabbis unregenerate, the pastor and his congregation have no discernment of Spirit. No new birth. Any agreement between the Christian Church and Judaism, suggesting in this way that they are two powers giving legal form to this New Age attitude would be a resounding instance of flagrant contradiction. Judaism is Pharisaism which became Talmudism, Talmudism became Medieval Rabbinism, and Medieval Rabbinism became Modern Rabbinism. But throughout these changes in name . . . the spirit of the ancient Pharisees survives, unaltered . . . from Palestine to Babylonia . . ." to the west coast of America (Rabbi Louis Finkelstein, The Pharisees, The Sociological Background of Their Faith"). Jesus called Judaism anathema to God (Mark 7:13). And these people are impersonating the descendants of Abraham, Isaac and Jacob. The man who does not share the views of the Talmud and who has any Christian sympathies, human decency or moral standards is duty bound to rid himself of views of reconciliation between Christ and the Devil as proposed. This modern tendency, manifest among those who would gladly bring Christianity into harmony with all ideologies and social movements was the objective of Vatican II. With every advance and about-turn, is this not a sign of heresy and apostasy, even if it is unconsciously present among many in Message circles (Revelation 3:17)? God's Word calls for a total separation from unbelief. As It separated Abraham from Lot It has separated us from Rome. Like Lot, the (once) Protestant church chose the worldliness of sinful Sodom to His Word so God separated us from the Protestant denominations. Just look what became of Lot and his daughters. The Prophet said, "The mere association of kindhearted people with the true believer might well bring death in return for their kindness". Why did God separate us from Rome and her harlot (once) Protestant daughters? Was it because He wanted us to feed our souls on the Talmudic filth believed by the false 'Jew' contrary to the Law and God's holy prophets? I think not! I wouldn't spread that on the garden! God sent us a prophet with THUS SAITH THE LORD. He finished the mystery of God. Since we now have the perfect interpretation of the Word, why should we hear an apostate self-styled Jew? It's late. Brother Branham said, "When the foolish virgin begin to see that they have no Oil of the Holy Spirit, that is the hour when the door of the Gentile dispensation is shut!" Just because a minister witnessed the ministry of William Branham does not mean he is a Christian. Judas Iscariot was such a minister! So was Matthias. Judas was a witness to the ministry of Jesus Christ. Mr. Iscariot was the most trusted witness among all of Christ's disciples. A certain minister who knows all the stories told me of a big man in the Message who asked, "Brother Branham, will I be in the rapture." After a minute's silence, Brother Branham replied, "Yes, Brother . . . but by the skin of your teeth". "In the rapture by the skin of your teeth!" Everyone born-again in this Age is already in the rapture. They can't not be in the rapture. The only possible message I see in the Prophet's reply is, "Brother, you are not yet born-again, but you will be born-again before death or before the close of the dispensation. Had you relinquished your business activities as I admonished, you would have had time to reflect, for if your new birth is so late, you will be unable to bring your people into the faith. You are condemning good people to the Tribulation." I have observed men of renown in this Message building personal empires of any who would follow. It didn't matter if they had faith or even believed, and character did not inhibit acceptance. So long as they were compliant they increased their virtual empire and influence. The folks back home paid well for apparent results! "Oh, the precious saints here, or the precious saints over there." Never any negative—regardless if the report was untrue. Bad news is bad for the ministry business. I wondered how man could be so evil and why so many ministers whom I once respected were such Judas'. Jesus must have wondered. The Bible says, "Jesus wept". Years ago I learned that over an extended period several websites in Message circles under the same 'big name' posted notices disclaiming the revelation just discussed. Men-pleasers without the Spirit, warning against God's Truth. Calling me anti-Semitic because we teach scriptural truth supported by historical facts when it is they and their ministers who are anti-Semitic. Never mind, world events are moving swiftly with barely any attempt to disguise sin. The Internet has seen the Truth is disseminated, censorship is now underway. Past sins are coming to Light; men are rushing frantically—not to cover their sins but because they sense the world system is imploding. Good manners, institutions and industry, even nations are collapsing into anarchy. God's grace has almost expired. Money and the morals that once held the system together are dissolving. Those in the know realize money will soon be worthless. They want to preserve power. All of this will soon be replaced by totalitarianism. Which form of totalitarianism will it be? Roman Catholicism, the Jew's money-power, or their atheistic Communism? Judas betrayed Jesus to Edomite Jews who betrayed Him to Rome. Once again the Word has been betrayed to Edomite Jews by trustees of the Message of the hour. In four years-or-so those Jews will betray It to Rome. "Perhaps the founding of the state of Israel, enthusiasm for western science, and the experiment with that universalist Jewish heresy, Marxism, has absorbed the energies of our most creative spirits . . . and Judaism will begin to step into its vital and dangerous responsibilities among the nations" (Rabbi Stephen C. Lerner and Mark Jay Mirsky, My Search for the Messiah, p. 21). They are 2,000 years too late. And with names like "Lerner" and "Mirsky," I doubt their forebears were in the Temple records so that these 'Jews' will not find Him after the Gentile dispensation has ended. What about you? Are you ashamed of Messiah. Is His Word by a vindicated prophet insufficient, causing you to seek Him in Jewish fables? Run, run—they're running in all directions—away from the one thing needful: Jesus Christ. Like Esau, they've reached a place of no more repentance.